pilihan peminat: HELL NO THATS SICK!!!!!! what do anda think is the best? which team do anda perfer? If Hwoarang and Jin are together, do anda think Jin should be on top? Do anda really think that Hwoarang and Anna should be a lovely couple? 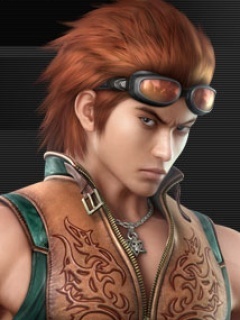 what do anda think Hwoarang's last name is? NOW ON WITH THE FANFIC!!!!!!! Hwoarang: That copy cat guy is really good at being someone else huh? Jin: What are anda doing here? Are anda crazy? bahagian, atas it off, the contest is only 5 days away! Jin: How can I cool it Hwo? My dream is slowly slipping away! Hwo: Isnt your dream to defeat Heihachi in the tournament? Jin: I am entitled to lebih than one dream anda know. Jin: So, did anda post up our banners this time? JIN/JUL…ITS JUST NOT GONNA HAPPEN! Jin: This is so pathetic! Hwo: Tell me about it! Jin: Yeah. The only people we had auditions from were Lei, and old people. Hwo: Dude, Lei IS old! Jin: Oh, yeah. Well, it was hard to tell the way he was beating the crap out of you! CHAPTER 7 PREPARE TO PEE IN YOUR PANTS! WELL, NOT REALLY. Hwoa: hei Jin, anda think anybody is going to come? Hwoa: So why are we just sitting around here? Jin: Because we are just poor pathetic losers who don't have a life and think that the whole world revolves around fighting and nothing else because we don't have a future and know it. Why'd anda ask? hei EVERYONE! SORRY THAT THIS TOOK WAAAAY TOO LONG! Lei: Hey. I come heyre fo audition. Hwo: Because…he's not "our image". Jin : What do anda mean? Hwo: Dude, look at him! He's a cop! Hwo: I have a bad boy image to maintain! Jin: Whatever, you're an idiot. Hwo: Well, what about his accent? Lei: Yu maki fun of mi assen? Jin: Well, that was a big waste of time. Hwo: I NEVER want to go through that again! Jin: Still, anda didn't have to be so mean. Hwo: You're such a pansy. Jin: So I'm a pansy for not totally heartless like you? Hwo: Exactly….wait, NO! I am not heartless! Well, not totally. I have a heart. Jin: Yeah, only when anda want something. Hwo: What do anda mean sejak that? Anna: He's right Hwoarang. When will anda learn! Hwo: Can we change the subject please? Jin: Okay. Anna, just sing for us. Anna: Sure! Prepare to be dazzled boys! *Clears her throat* And now, I begin! I~have—Bieen—wait-ing, FOR yoooou….buy MY Hearrrrrrrrrrrrt, wont Taayake…any lebih pay-ay-ane! Well, how did I do? Jin and Hwoarang gape at her with a blank stare on their face. Their mouths were hung wide open. Hwoarang was starting to drool. Hwo: Is it okay with your parents to hold the audition here in the basement? Jin: Yeah. My mom's cool about it. But I don't know about my dad. He kinda likes peace and quiet. Hwo: Great. This is going to be funner than I thought. Jin: Funner isn't even a word man. Hwo: So? anda got a problem with me? Lets go Kazama! Jin: Is that you're problem to everything? Fighting. anda know I always end up kicking your $$. an answer was added to this question: look what i made!